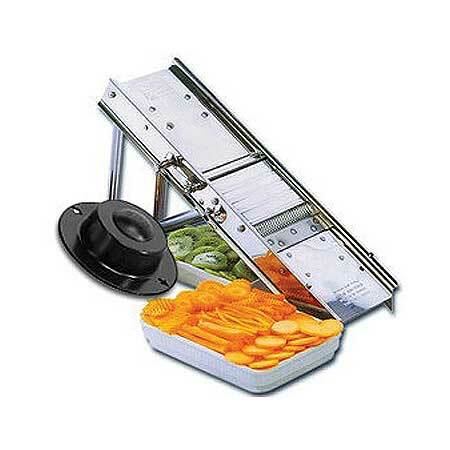 Eurodib mandoline, professional model made of 18/10 stainless steel. Hard stainless steel blades. Includes the black polycarbonate hand guard. Bron Coucke mandoline for slicing a variety of fruits and vegetables. Patented table edge. Includes: 1 x 19638 (Julienne Blade), 1 x 3802 ( Flat Blade) and 1 x 10201 (Polycarbonate hand guard). 5"W x 2"H x 16"W.